Bottle: 11" X 2" in Size and holds 25 ounces! 【FLEXIBLE BOTTLE】 Easy to squeeze with a no-leak spout, this lightweight bottle is great for any indoor or outdoor activity. It's also outfitted with a carry loop for easy transport anywhere you go, making it great fun for children and parents at baseball, soccer, lacrosse games and more. 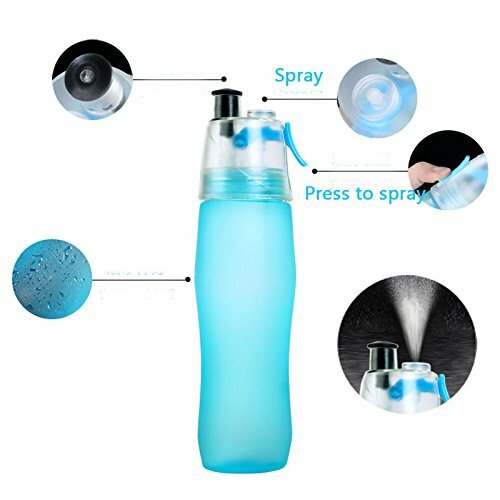 【2 IN 1】 This water bottle is also a sprayer! Open and close water bottle with a button to spray mist! 【LARGE SIZE】This Mist and spray water bottle is 11" X 2" in Size and holds 25 ounces! 【VALUE】Great Quality at a great price! 【EPIC GIFT】This will make a great gift for any active person in your life! 【FLEXIBLE BOTTLE】 Easy to squeeze with a no-leak spout, this lightweight bottle is great for any indoor or outdoor activity. It's also outfitted with a carry loop for easy transport anywhere you go, making it great fun for children and parents at baseball, soccer, lacrosse games and more. 【2 IN 1】 This water bottle is also a sprayer! Open and close water bottle with a button to spray mist! 【LARGE SIZE】This Mist and spray water bottle is 11" X 2" in Size and holds 25 ounces! 【VALUE】Great Quality at a great price! 【EPIC GIFT】This will make a great gift for any active person in your life! If you have any questions about this product by EpicGifts, contact us by completing and submitting the form below. If you are looking for a specif part number, please include it with your message.